I have been to Sado-Island for two days by my Estrella in July. 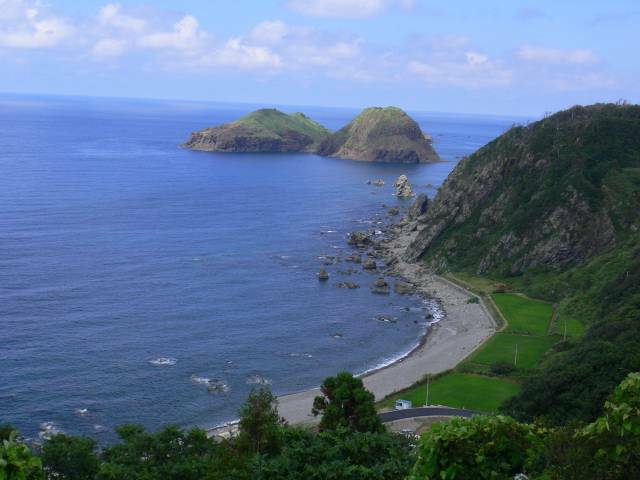 Sado-Island is located in the sea of Japan where 300 km North from Tokyo. 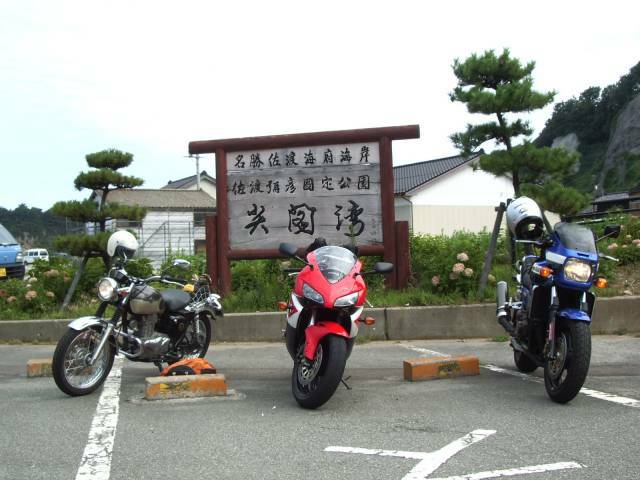 I had two companions with this trip and their bikes were a Kawasaki ZRX1300 and a Honda CBR1000. You can easily imagine that it was hard for me to catch up with these two big bikes! These are our bikes. This photo is very North of Sado-Island. In the background you can see an island called "Futatsu-kame". Futatsu means "two" and kame means "turtle". It seems two turtles are lying on the sea, so they call "Futatsu-kame". 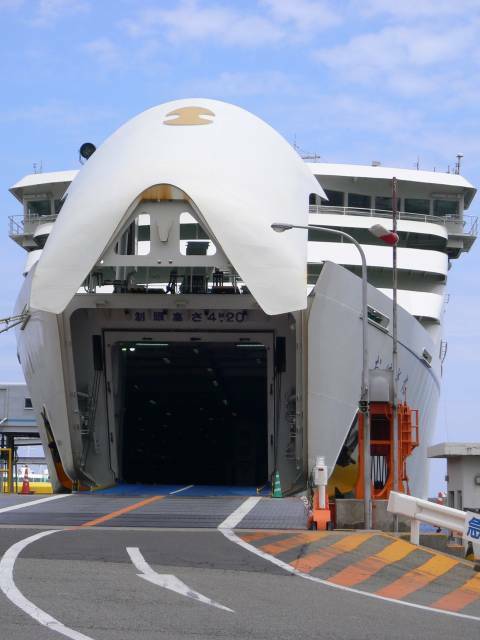 The last photo is the ship that we aboarded to across the sea of Japan. I was very tired when I was back home, but the view of sea was beautiful and the seafood was delicious. So wonderful time I had! Sorry for response rate. I've been to Europe for a business trip. Been to France, UK, Belgium, Sweden, Denmark, but unfortunately no chance to visit Deutschland. But my company has branch office at Germany, so I am looking forward to visiting German soon. 1. What do the japanese letters on the board say??? 2. The "Two Turtles" are very nice! They remind me of the "Calf of Man" on the Isle of Man in the Irish Sea where I was in 1997. 3. Where is the branch in Germany? In Düsseldorf where the highest Japanese population in Europe is? Düsseldorf is only 80 km (50 miles) from Dortmund. Wonderful pictures and a very nice report! I hope we'll get more reports like this! Can't wait to receive a photo of your Estrella under a Japanese cherry tree in spring! The place in the Estrella calendar 2007 is already reserved! Thank you for the wonderfull report and the pictures. Hope to see and hear more from Japanese riders. I'm glad that you enjoyed my trip report and great thanks to Andreas that published the report instead of me. > What do the japanese letters on the board say??? These are written in Japanese kanji.The first row says "MEISHO SADO KAIFU KAIGAN"
second row says "SADO YAHIKO KOKUTEI KO-EN" means SADO YAHIKO National park. This place is part of Jananese National park. The third row says SENKAKU-WAN, which means SENKAKU bay. > Where is the branch in Germany? It's in Fürth.I've never been there.What kind of place like? I've been to many places in Japan by bike and took many picture,so I will publish at an opportune moment. Fürth is in the North of Bavaria. madmacmic lives in Fürth! He is no Estrella owner yet, but wants to become one. And Toni lives in Nürnberg near by! It's about 450 km (275 miles) from Dortmund. A bit too far away. Well, well, well, nice report, but there are quite a few "Fürth"s in Germany.